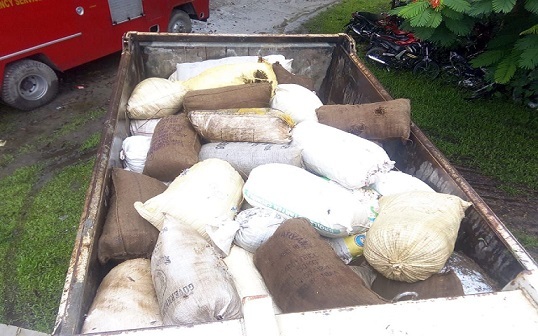 In yet another incident of ganja haul, police in Lakhimpur’s Narayanpur area recovered 70 bags of ganja hidden inside a dump decker truck on Saturday. The dump decker truck bearing registration number AS 01 G 7111 was intercepted on the Tipling flyover near Narayanpur on NH-15 with the narcotics. Seven persons travelling in the vehicle were arrested by police. They are Hamid Ali, Gurucharan Mandal, Abbas Ali, Abdul Rashid, Tichi Tango, Babu and Manju Dey. The dump decker was coming from Arunachal Pradesh. According to police the market value of the seized ganjas was estimated at Rs 20 lakh. It may be recalled that this is the second haul of ganjas from Naraynpur area within a week. On August 29, police recovered ganjas from a mini commercial vehicle on the Bhogpur-Dorpang road near Narayanpur.